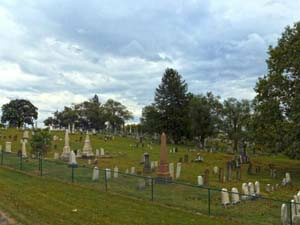 This cemetery dates to 1780 and was one of the important sites in the Whiskey Rebellion. This oldest part contained over eight hundred visible, though not always readable graves. "I would like to take this opportunity to describe the process in which this data was compiled so that it may be better and more truthfully interpreted. First, the monuments in the cemetery were numbered according to the system that is roughly illustrated in the attached map. The map is intended only to roughly describe the numbering system that was used. As a rule we tried to number in a snaking pattern. Second, the information from the stones was collected by numerous volunteers, and recorded on the supplied form. The information from these forms was then taken and put into the attached database, where it can then be sorted numerically by site and alphabetically. Since numerous people did the entries in the database, the system of notation may vary slightly. In general however, an asterisk (*) or a blank cell represents missing data. Brackets represent what it is logical that data be within its given context. In several cases an asterisk following data represents that it is guessed. In the event that only the date of birth or death was supplied on stone accompanied by the age of the person at death, simple subtraction or addition was done to determine the missing year of death or birth. There is not a specific symbol to show that this was done; however the age at death was usually put in the "Other" column. Notes have also been used as a reference to data that could not easily fit into a cell in the spreadsheet. " Misc. records, Records without complete identification.